If you find yourself thinking about something you saw six months ago, then it must have had an effect on you. And it's more than six months since I saw a sign in Cambridge advertising "free computer lessons". Why does it keep coming back to me - this yellow sign, tied to some railing to promote some local college or other? Because I found that it crystalised an anger that at times The State uses my money and yours - taxpayers money - to provide a non-core service which competes on a very unfair basis with businesses. Yes - we need The State to defend the country, to provide law and order, to co-ordinate the elements that naturally need co-ordination and to provide a safety net for the health, wellbeing and fundamental education of us all. All too often, it seems, The State, or its agents in more local government, step in and provide (or help to provide) something which is non-core and competes with businesses (sometimes involving themselves in areas which have previously been the remit of businesses), or over-regulate or over-specify. At times it's utterly frustrating to find that we're not able to provide a room for hire because some state organisation is already doing it for free doing it at the taxpayer's expense. And it's also frustrating to have to wade through half a tree of inane and duplicated terms and conditions - "you will provide suitable equipment", "you will CRB check your staff where appropriate", "you will provide appropriate seating" - all of which come simply come down in my eyes to "you will follow English law in the fulfillment of any contract". So why do we end up with such a mountain of paperwork, and situations where the public sector has expanded to encroach into some very surprising areas? Part of it is job-justification and empire building. But another clue comes in my mailbox, where a local parish council is blustering about the closure of a local technical learning centre, and the bandwagon is joined by a local terrier for the elderly, who feels that his congretation should get preferrential and free treatment. But this is an understandable reaction, as such things have been provided free free at the point of use in the past, and have probably been great vote-winners for the people who provide them. It would be very much easier, and very much more cost effective too, for us as a small business to be able to work with reduced paperwork, and not to have to compete with ourselves which - in effect - we're doing as we are the taxpayers that are funding all this "big government" stuff. But at the same time, I fear that a move in this direction planned under the current regime might turn our to be mostly cutting back on stuff, rather than redirecting it to more appropriate society and business channels - "We're going to stop doing X so you can do it if you want, but you won't really be able to do it as the financial infrastructure won't be there". a.k.a. "You can do this locally now, but we're capping the local organisations that would help seed it". Each in their own way has made a major contribution to society over the years, and through their middle ages nearly every one of them has been given responsibility for managing themselves, their own wellbeing and spending, and their own lives. So why is it that we take away from them, at a certain age, the right to spend their money as they see fit? Why is it that we don't simply pay the money that society puts into the elderly directly to them and let them choose whether they want to spend it on a day out to Bath, or a nice meal at the Silk Mercer? Ah - another case of big government, I fear! For sure - as we get elderly, we get more vulnerable. We need extra service and we won't have been able to make every decision earlier in life knowing what's going to happen later in our own particular lives, so there is a case for buffered / insured / state help in later years. And it's a sign of a caring society to provide it - but oh dear, we don't half overdo it sometimes, and it's little wonder that we have the radical local terrier described in the previous paragraphs - and others like him - demanding free this, free that, and preferential treatment here for his flock. We have a society which many believe "owes" them a living / a life. I suppose that's natural; when we're very young, it's our parents who support us - to the hilt. In early childhood, contributions are purely symbolic, and it's easy (too easy) for parents to continue on asking for only minor contributions - or none at all - as the child grows to a teenager and even a young adult. This is the "couch potato", with parent cooking, washing clothes, bedmaking and all the rest. There's a rude shock, then, when the son or daughter gets to the point at which they can and should be taking major responsibilities for themself/ves. Some - many - do it naturally but all too many feel that "society owes them". And we end up with a "gimme" society. I was struck when recruiting recently by the contrast between the two groups. Several applicants didn't approach us directly, but rather we got a call from mum, or a wife approaches us to ask if we've a job for her husband. Yet that's even better than the countless people who are out there, I understand, living off the various forms of government finance, perfectly capable of doing something / making arrangement which will let them finance themselves ... but who don't even have the gumption to apply. The incredible thing is that some of those who did apply have circumstances which actually mean that they've got far less slack / buffer time in which to work, but never the less have the enthusiasm and drive to have applied and indeed to have (in some cases) filled roles. And I'm proud to have a team that's enthusiastic, and well rounded outside our work too. "What a useful piece of software. It would be so useful to me - can you sell me a copy?" "No - I can't, I'm afraid; I work for a government organisation and we're not in the business of writing and selling software as that would be competing with private industry"
I'm not sure how true - or appocrafull - this story is, but it's the story that's told about Perl - the Practical Extraction and Reporting Language - that was initially written by Larry Wall when working for a US Government organisation. Larry had, I understand, to extract summary reports from large amounts of data, which was distributed between six machines on a network spread between the east and west coast of the USA - and with a "fast" (1200 baud, the rumour tells me) modem connection between them. "But ... " thought - and said - Larry "I can give you a copy. After all, it was written with taxpayer funding and you're a taxpayer ... and there's nothing secret or classified about it". And thus was born (it is said) the Open Source movement. Note that my sources on this story are somewhat hear-say, so you should consider it to be true in gist, not in detail! Since its initial release in 1988, Perl has become a vital component used in many software solutions. The blog on which I publish these ramblings is written in Perl, and I've taught Perl to the staff of dozens hundreds of different organisations. And that's just me - I'm a very very minor cog indeed in the Perl World. Perl is a fantisatic tool - but it's easy to use once you know it well, rather than being easy to learn; there's something of a seesaw decision to be made in this respect when you're specifyin a product and Larry chose ease of use. [about the image]. 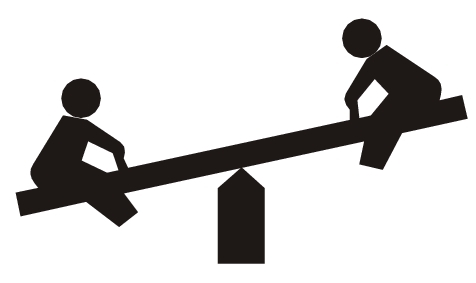 I guess whether it's Perl, state's big business, or the amount of regulation it all comes down to that balance again - which way should the seesaw go? Thank you for reading; I'm afraid I'm going to disappoint you by not coming to any conclusions - but at least I may have triggered some thoughts. No cold sales calls please - but delighted to hear from others! How effective is our publicity? How much parking should there be at Melksham Campus? Low carbon and other environmental lessons for the Melksham Campus? How important is public transport to people in the Melksham area? Apache Internal Dummy Connection - what is it and what should I do with it? Should we take sponsored adverts on our site?